Are you looking for some slick new additions to the corners and the tables around your home? Whether it’s for your home office or as an accent in the bedroom, we’ve compiled a beautiful list of ideas to choose from. 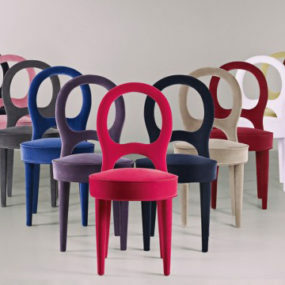 These 40 modern chairs can be used for any room of the house! Start shopping and brainstorming now! 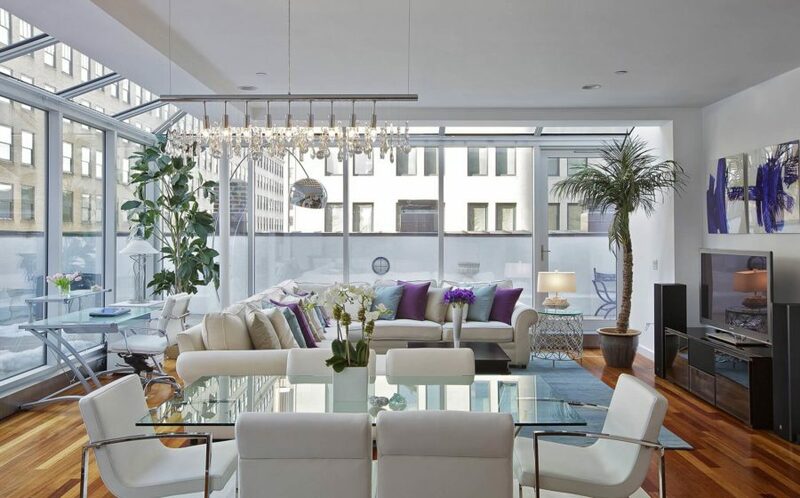 Check out these slick white chairs complimenting this contemporary living room. The pair balanced out the darkness and accents the navy blues and rick charcoal quite well, adding a touch of lightness to break up the mystery. Whether it’s a pair or one at your office desk, these polished designs are a versatile choice. Home Stratosphere provides us with this light and bright modern living room filled with inspiration. But we’re paying extra attention to the chairs today and instantly fell in love with the dining room choices. A combination of white and metal, this easy and clean design is the perfect addition to a glass table and studio-style home. These teal beauties can be used around the house with ease as well. We love the innovative lines of the legs and that they’ve been dipped in a unique color that has the ability to compliment a variety of neutral tones. Fitting into a modern space nicely, the design allows the pieces to fit inside more traditional or even rustic spaces as well. Pinterest always gives us beautiful inspiration. And not only is this room full of fun textures and contemporary spirit, but it’s got some versatile seating choices as well. The linen cushioned chair is a great piece to have around and break up the lushness of a full sofa and loveseat. 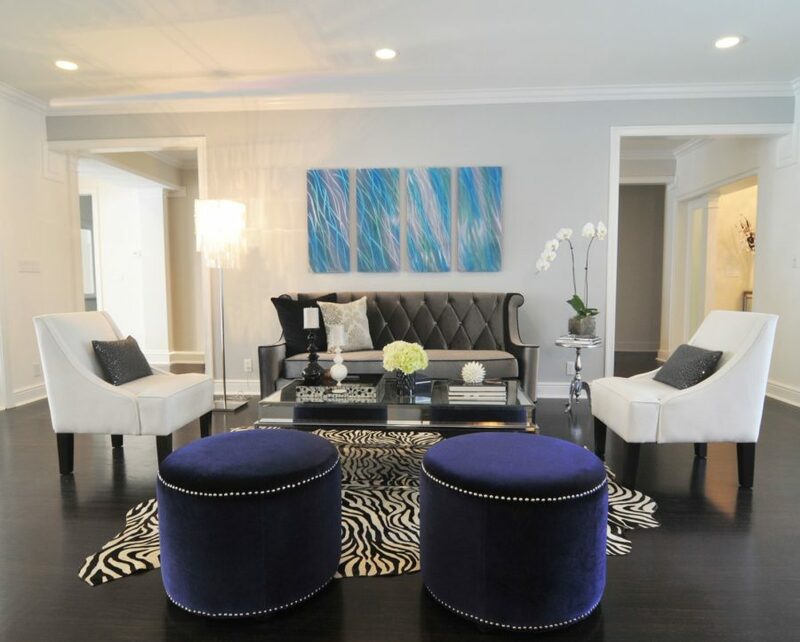 And the charcoal accent chair on the other side of the room creates an even cozier vibe throughout the welcoming room. Decoist showcased this fun office space and we scooped up the opportunity to show it off. We love the combination seating. It provides a richness and personality to a room that needs a pinch of originality. But the artistic chair and studded design both compliment each other and build the other one up where it lacks. Balancing out chunkier pieces of furniture with more delicate pieces is the key to styling your home. This is especially true in rooms that don’t hold as much space as other. Boncville had this neutral beauty up their sleeve which includes a contemporary desk chair with a clean finish and wooden legs. Your modern seating choices don’t end with a simple chair. 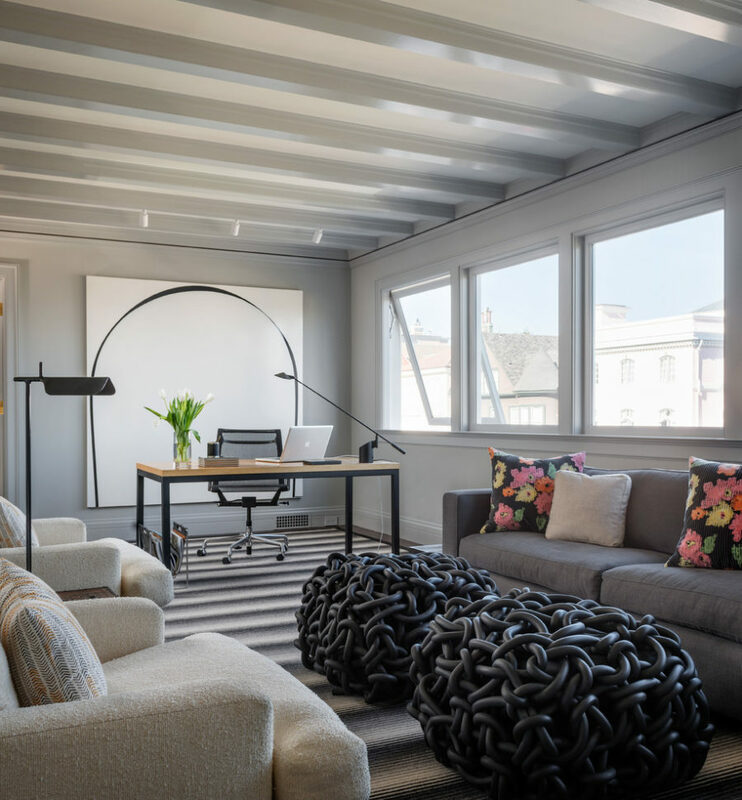 Look at these chained puffs igniting the style throughout this home office. Use them to put up your feet or seat some extra guests inside the space. 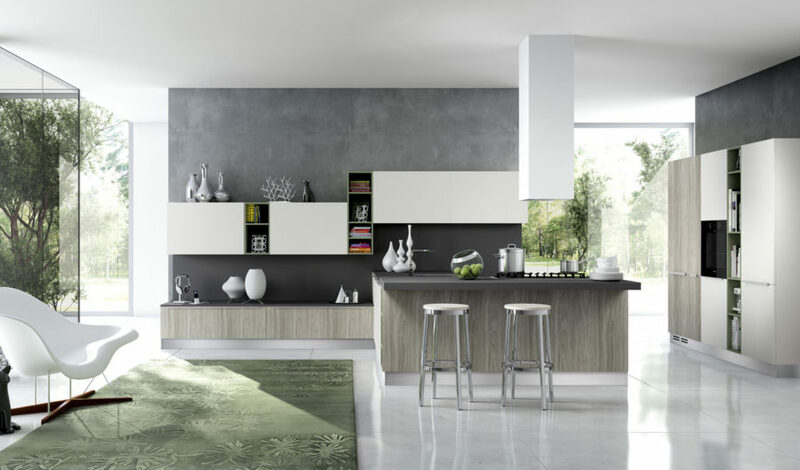 Design Trends shows us that you don’t have to skip out on style just because you’re looking for function. 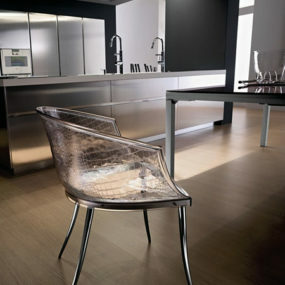 Interior Design Ideas has a kitchen that brings us two bouts of new, modern seating inspiration. Shining metal stools at the breakfast bar and a curved beauty in the corner help to create a futuristically-flavored morning routine. We love that the chairs here are clean and polished without taking up too much space inside this light and bright room. Freshome allows us to take a peek inside this elongated space filled with a dining room table and breakfast bar. On the far side of the kitchen we get a look at some simple, metal stools that support the style and the family for their morning bowl of cereal. Moving down the hallway, we stumbled into a mixed-material dining room table filled with some industrial chairs. We instantly fell in love with this modern accent chair from Keri Brown Homes. 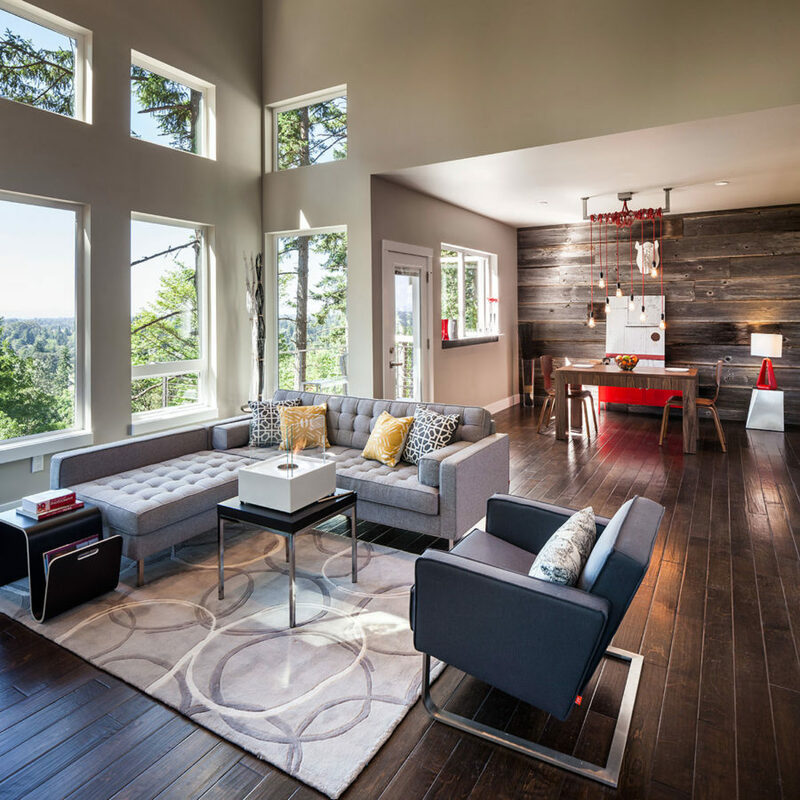 It’s dark charcoal fabric compliments the natural lighting and hardwood floors throughout the living room. It’s got a traditional tone but marked by futuristic style with it’s innovative metal base. All it needed was a patterned throw pillow to finish it off. Check out this fun pair from Amaza Design. It’s another charcoal pick but this time with delicate legs and a footstool to match. It too compliments it’s lighter and brighter surrounding creating a focus and accenting the large artwork on the wall behind it. Add a throw pillow or patterned blanket to personalize the look. 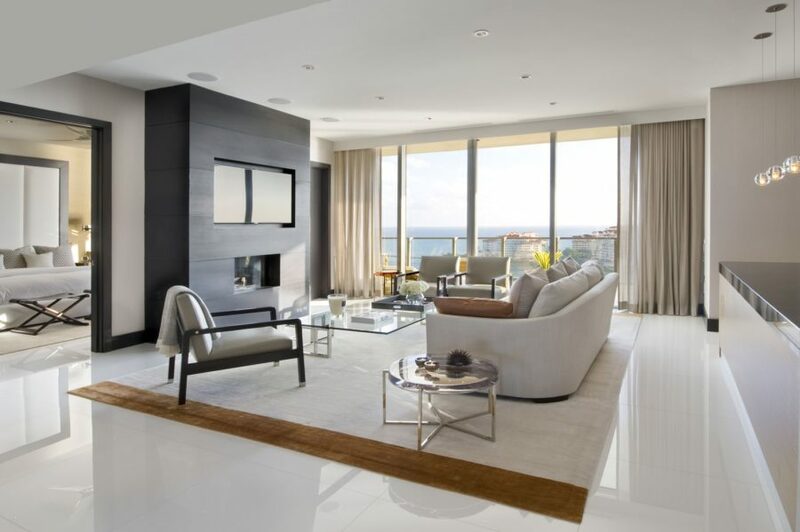 Interior Design Ideas featured this beautiful and spacious living room and dining combination. We may have first been drawn to the high-ceilings and built-in library, but it’s the dining room chairs that provided us with the right kind of inspiration. 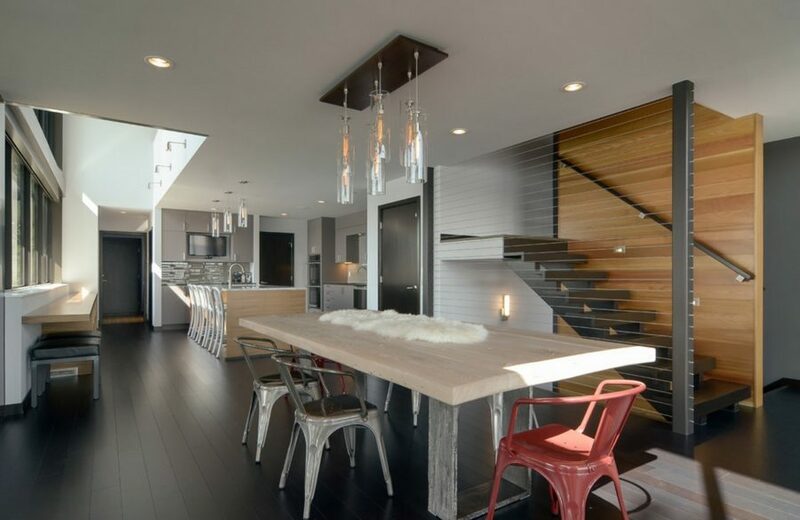 More traditional designs sit at the head of the island while more futuristic and contemporary pieces stay over in a monochromatic style near the white dining room table. 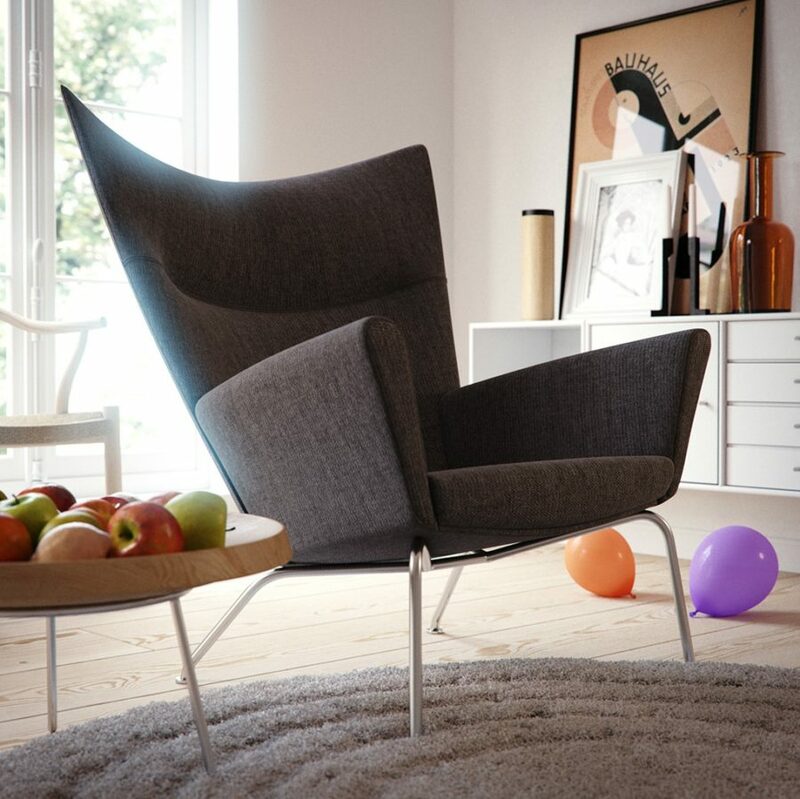 There’s something extra special about these chairs that we found over at Homedit. At first glance, you may think they’re been made out of paper, with all the right creases and bends. But, that’s jut a part of their modern, artistic charm. 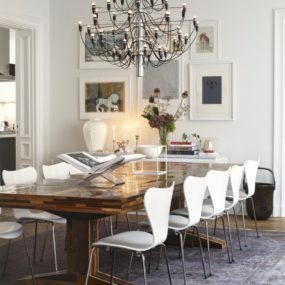 Complimenting the clean dining room table and feminine chandeliers, we’re in love with this stunning, neutral space. HGTV gave us this charming little office chair. It’s the perfect bout of inspiration for DIYers that want to redo an older chair they may already have as well. All you truly need is the right kind of fabric that represents your personality and personal style. 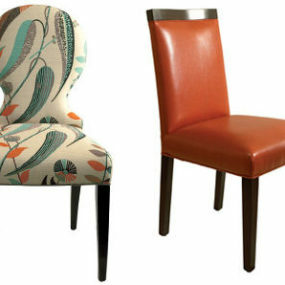 Here are some more accent chairs that encompass that welcoming, lounge-type feel but provide a polished finish as well. Add a bit of gold into your home with a piece that’s similar. We love the texture of the fabric as well that blends in nicely with cleaner surfaces. HGTV had these fun dining room chairs up their sleeve as well. If you’re a fan of chevron prints, then these pieces are right up your alley. 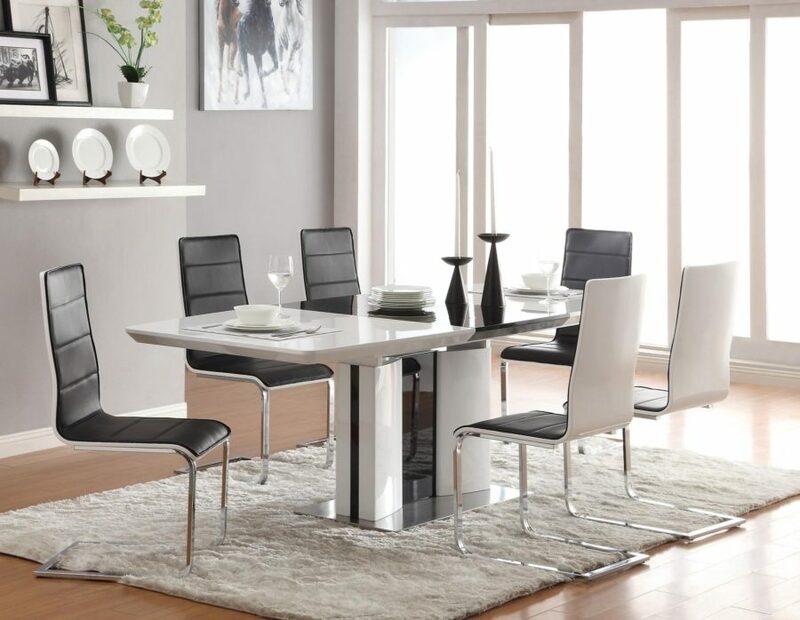 Add some extra pizazz and personality to your table by adding similar chairs. 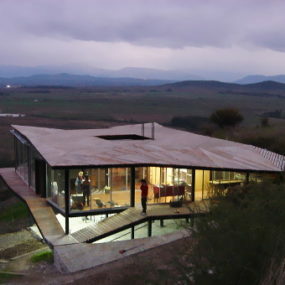 Again, this is great inspiration for a home redo or DIY. 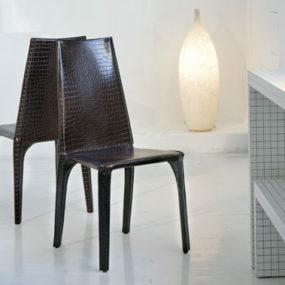 Decoist had a bit of modern chair inspiration as well. Just look at these dining room chairs. Perfect inside your home office or accenting your kitchen table, these black acrylic designs are just too much fun to look over. We love how they’re making a traditional wood table pop with new life! 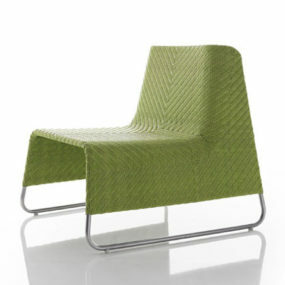 Your modern chair selection needs more than just sharp edges and lines though. You can find designs with a bit of plushness as well. Just check out this loveseat, sofa and accent chair set. 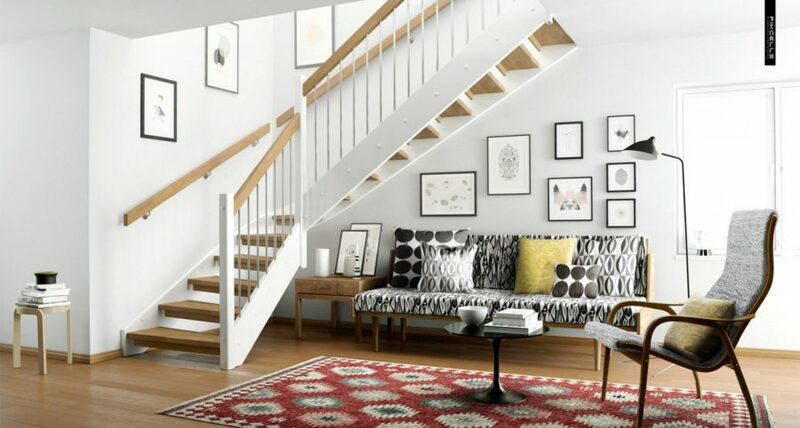 White, bright and with a bout of cushion too, this pairing easily fits inside a modern scheme. 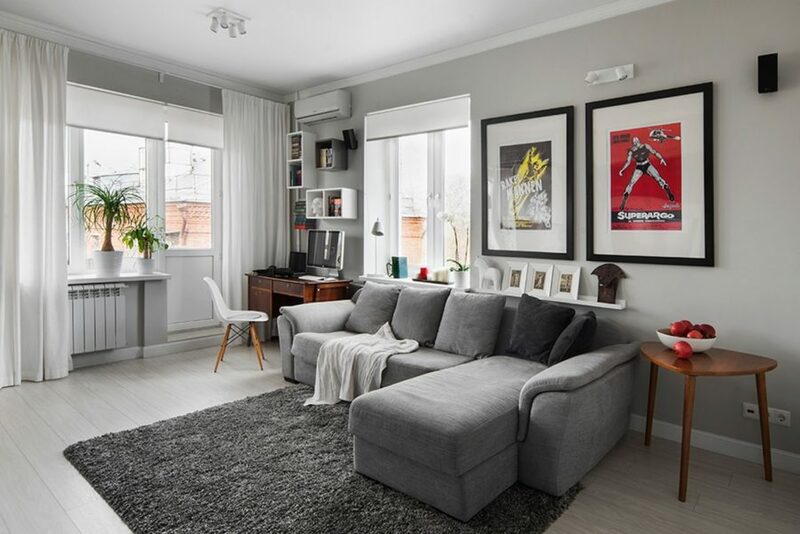 Interior Design Ideas showcased this upbeat living room and we not only became smitten with the neutral, upbeat colors but with the chair selection as well. 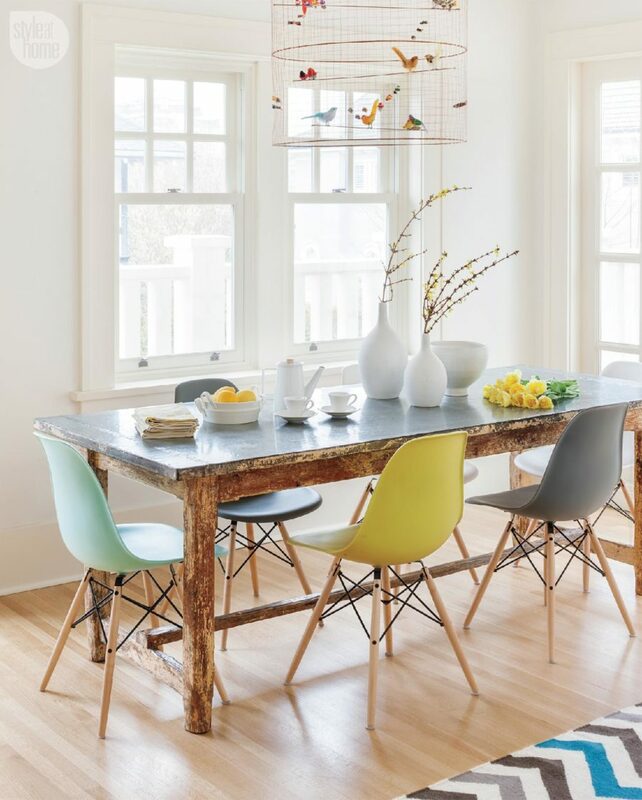 The wire rocking chair in the corner, the funky stools at the bar and the simple lines of the chairs sitting at the kitchen table, it’s a beautiful combination of contemporary styling. Here we have a personal favorite on the list. These acrylic chairs are the perfect addition to a modern home. Whether you want a set at the kitchen table, want one at your vanity or in your home office, they’re one of the more versatile of designs. Just check them out over at Ikea. 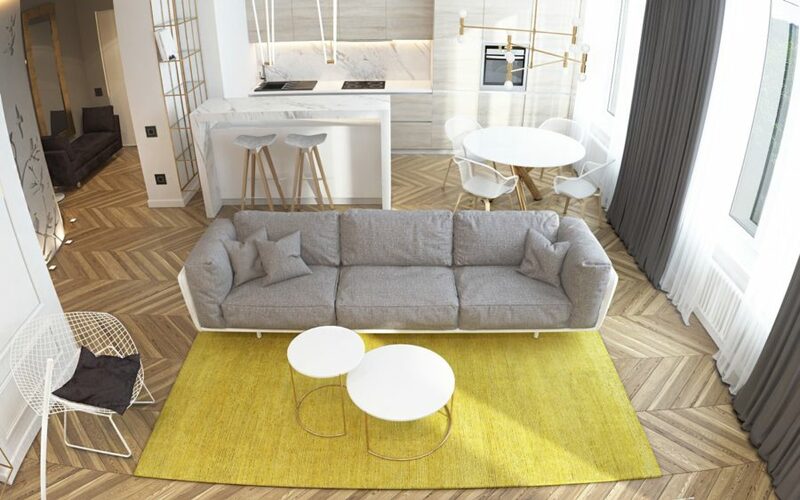 And now we have another beautiful example of a chic, contemporary space filled with no-fuss furniture. The accent chair in the corner, with it’s two-tone finishes, blend its surroundings seamlessly into its simple design. Accent pillows and throws personalize the look here as well and make it a bit cozier. Dining and Living Room had us swooning for this orange-accent escape. Black and white will always be a timeless color combination but the addition of this fiery orange tone is such a genius way to create something unique. And the seat selection throughout this entire space adds to the contemporary, artistic charm – from the zebra designs at the dining table to the black and gold stools at the windows. Dining and Living Room had this space up their sleeve as well. And it was just too hard not to fall in love with the unique chair design. 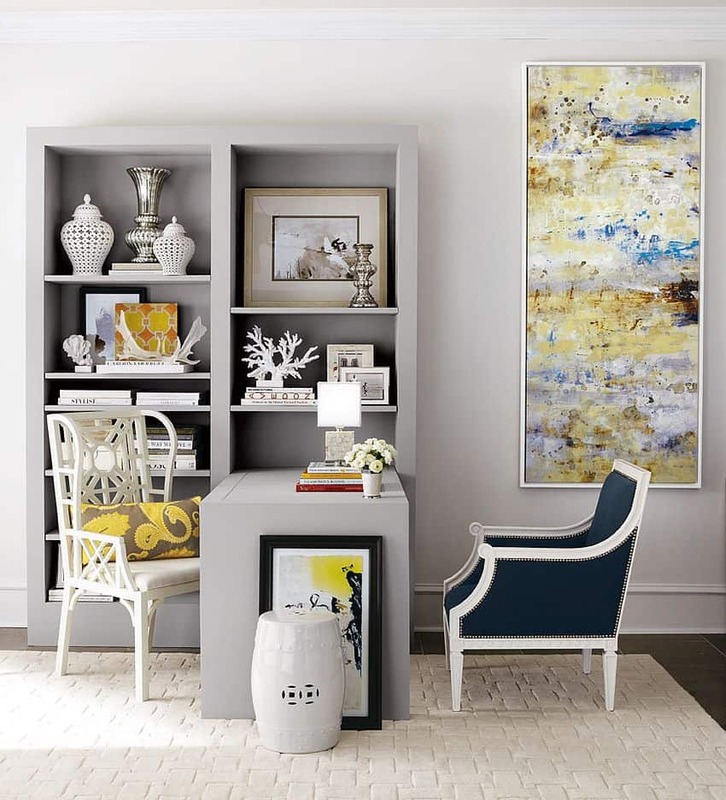 Both pieces are functional and fit inside a home with a modern art inspiration. 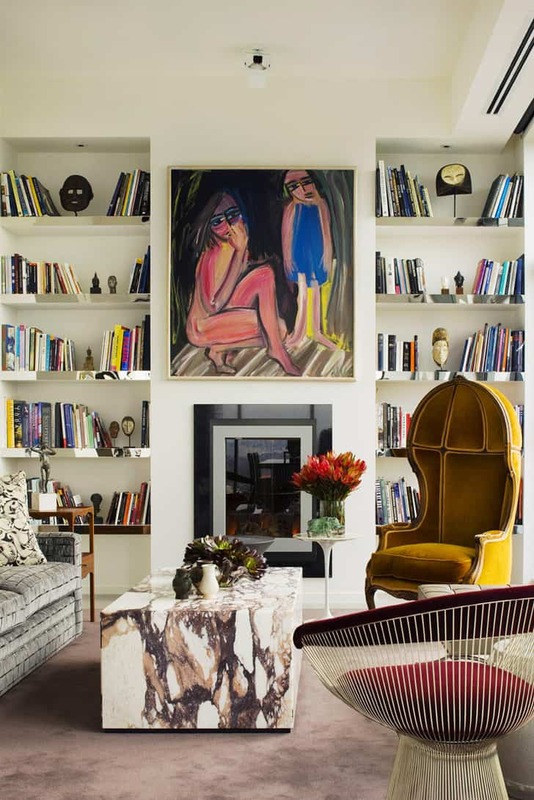 But both act as pieces of modern art themselves and create a fun focus for the room. 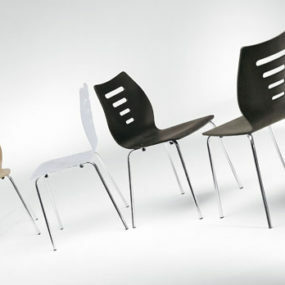 These mixed material chairs are one of the most trendy and most versatile of choices around. 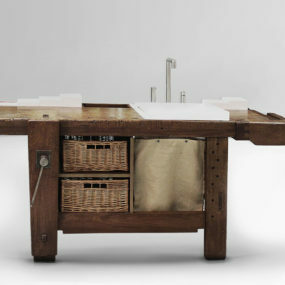 They blend well within a variety of style genres but also work, truly, inside any room of the house. From the dining room table – like you see here in this photo found on Pinterest – to the home office or playroom. 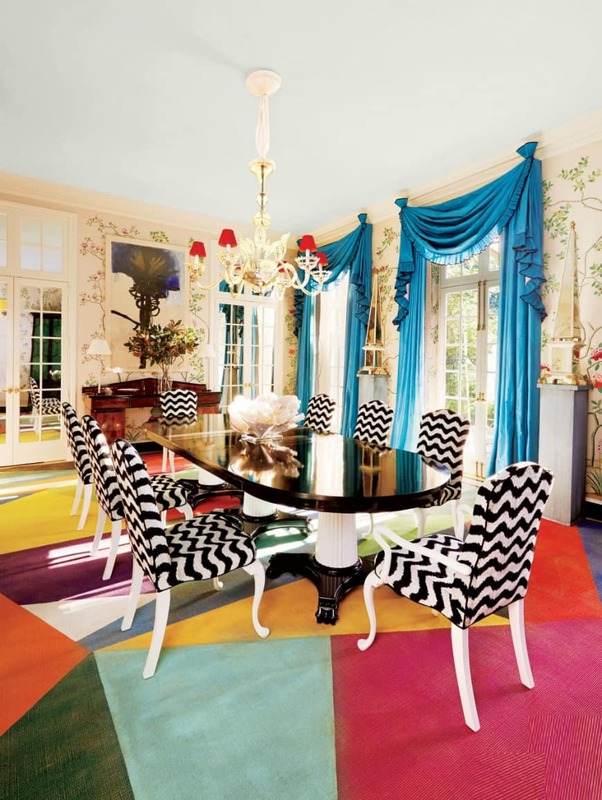 Brabbu gave us a giggle with this colorful and eclectic dining room. 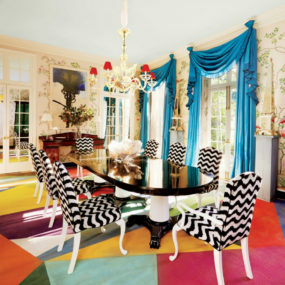 Of course, the multi-toned carpet creates a fun and personalized vibe but those chevron-zebra chairs create an even bolder style. If you want something both modern and innovative, then this room should inspire you in all kinds of ways. Ghost chairs will always be a favorite of mine as well. Not only because of their unique charm but because of their versatility. Place a set at the dining room table or fill up your home office with a clear or blush piece. Whatever the case, these are the designs to pick when you need a chic, modern addition. 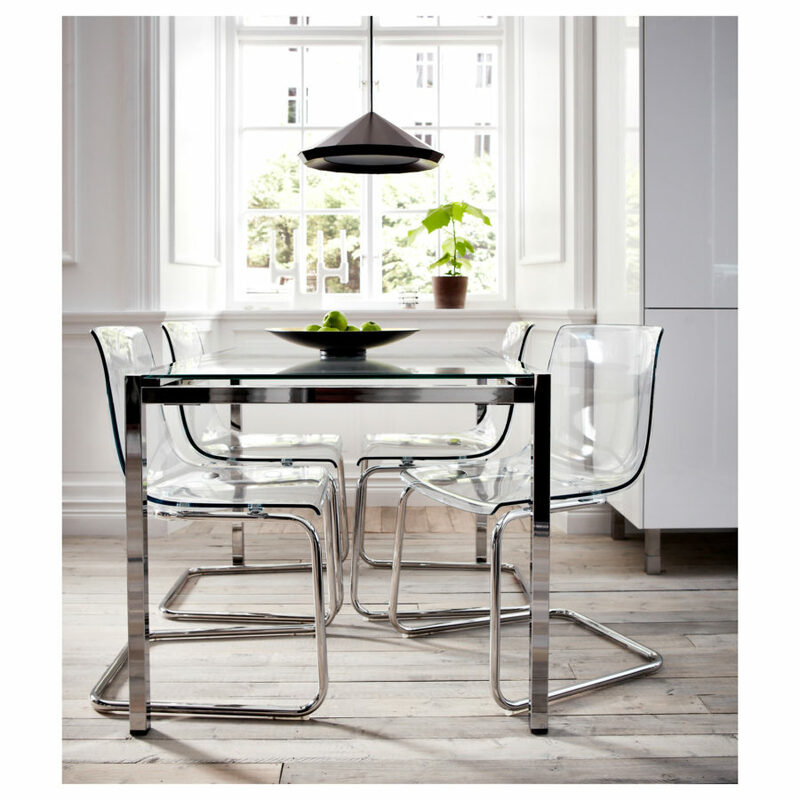 These one-stem chairs look gorgeous at large dining room tables. They dress up office desks quite nicely as well. Coming in a variety of colors too, you can find the right color for any room of your home. This is a classic style as well that will stay on trend, especially for more contemporary visions, for years to come. 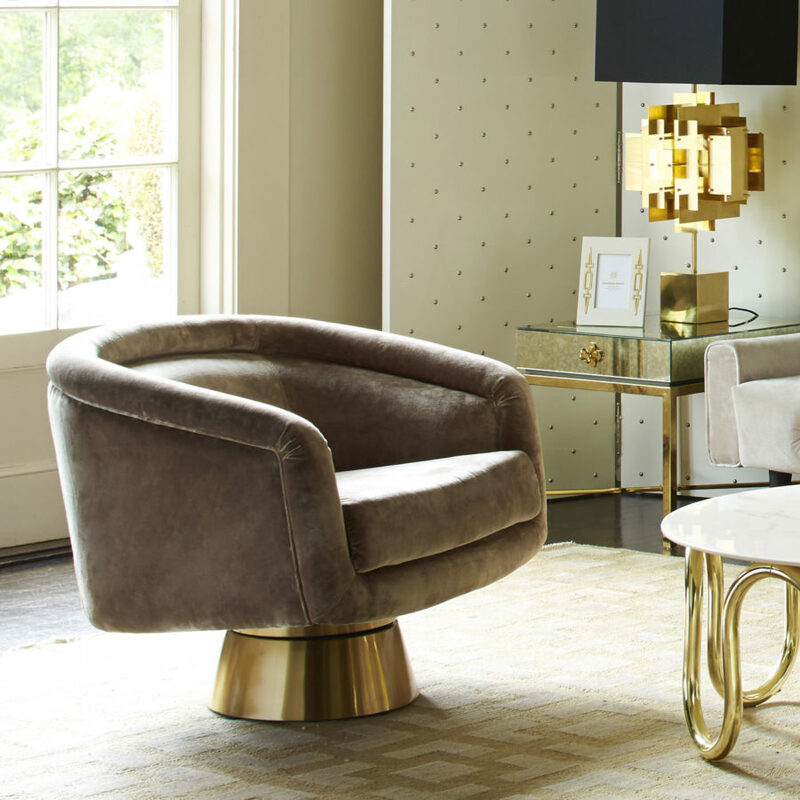 Jonathan Adler has this gorgeous swivel chair design in his collection. It’s truly a stunning way to accent your living room or even a spacious master bedroom. Coming in a champagne tone and blue reef color, its brushed brass base is where its innovative, unique presence gets started. Pinterest gave us this easy bout of inspiration as well. If you have a large family or want a space big enough to entertain larger groups, utilize every inch of your table. More delicate, cleaner lines will give you more opportunity. And because of the thinness of these chairs, you’re able to fit more around the table. 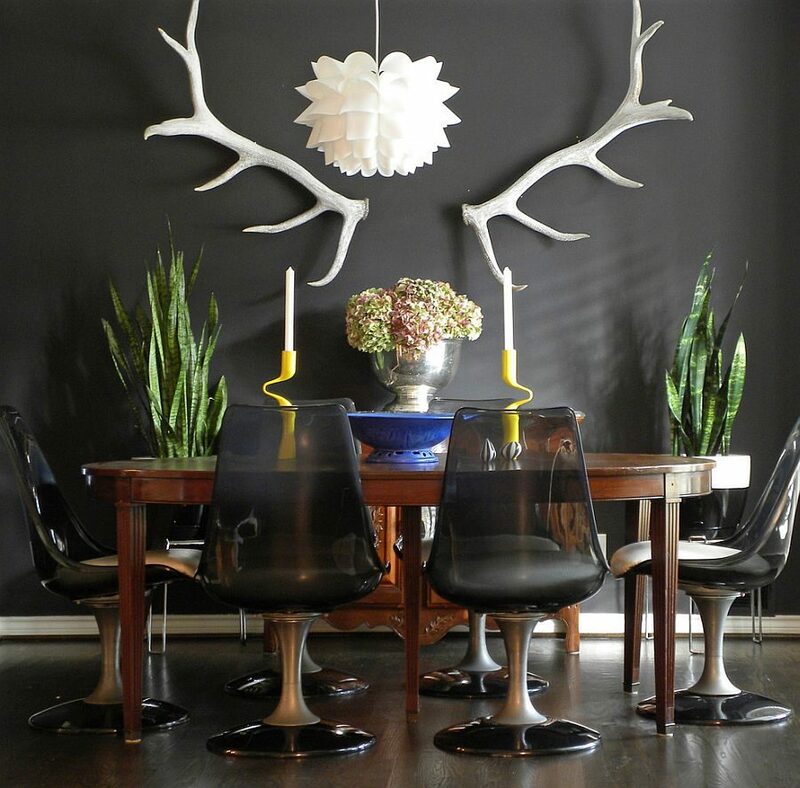 These simple black chairs will work wonders for your home as well. 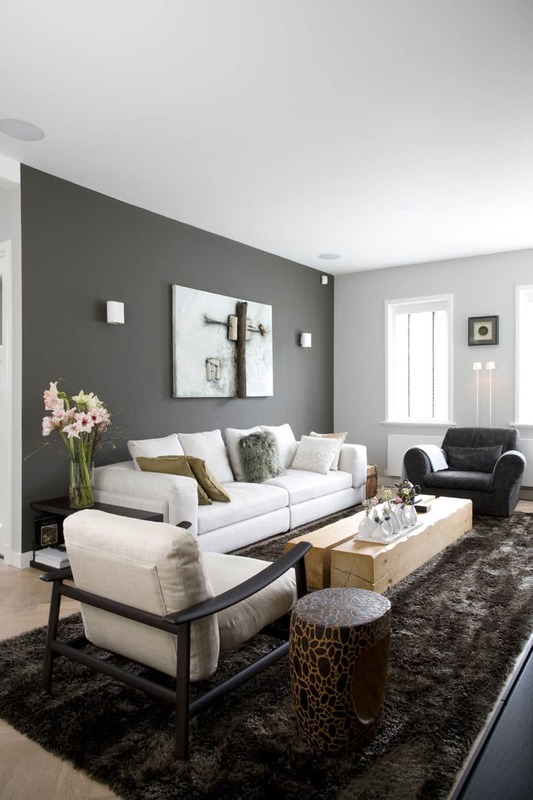 Black is the best neutral as it compliments all tones and all colors. And these clean designs can fit inside any nook or cranny you may need them too. Around the dining room table or as a seat in the study, they work! 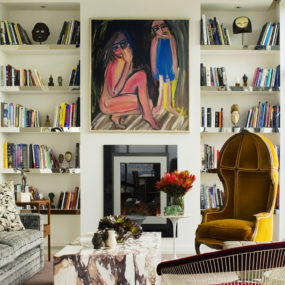 Check out these fun mixed-material seats from Room Ideas! A grey velvet and wooden base make for an interesting combination. It’s got a modern, fashion-forward style that fit into modern spaces, eclectic spaces or even youthful apartments with funky décor. These chairs look like they’re nearly floating around the table. 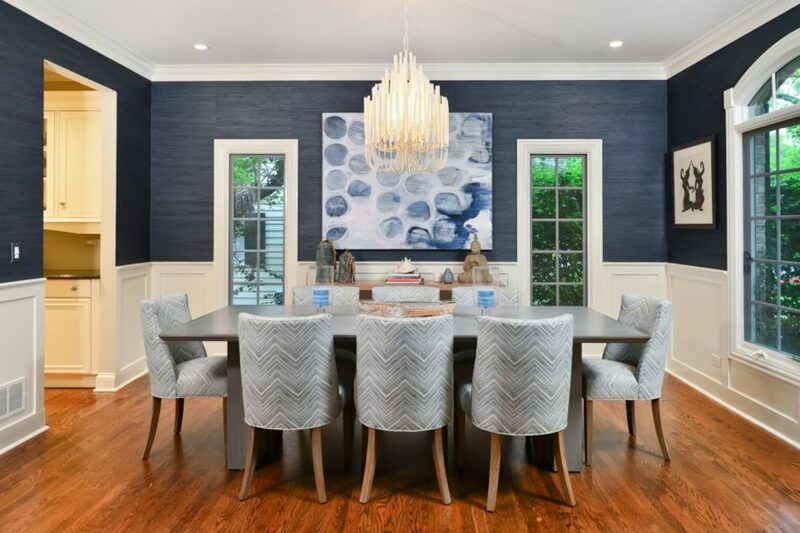 Ruchi Designs provides us with this stunning, crisp dining room inspiration. Black pleather and metal bases give off a polished ethos that coincides perfectly within it’s light and clean surroundings. 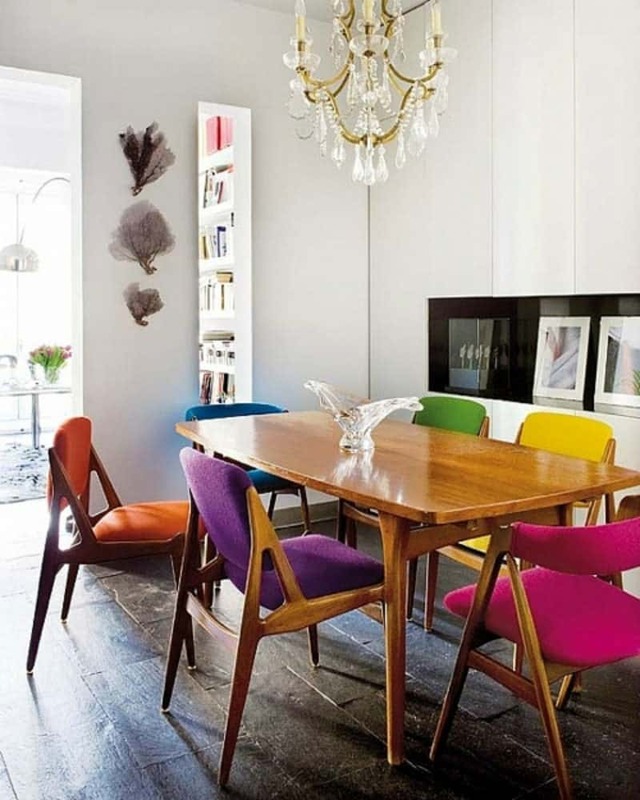 Delightfull shows us that you can be colorful without straying from the modern theme. Mixed with wood and some retro-inspired lines, these chairs do wonders for this space. 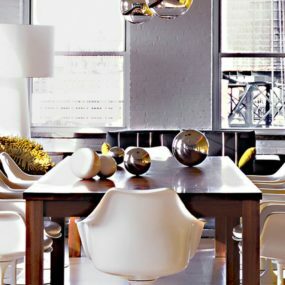 Adding personality and poise to an eclectic room, there’s a certain bit of fashionable envy surrounding every meal now. We have some more acrylic designs to share. 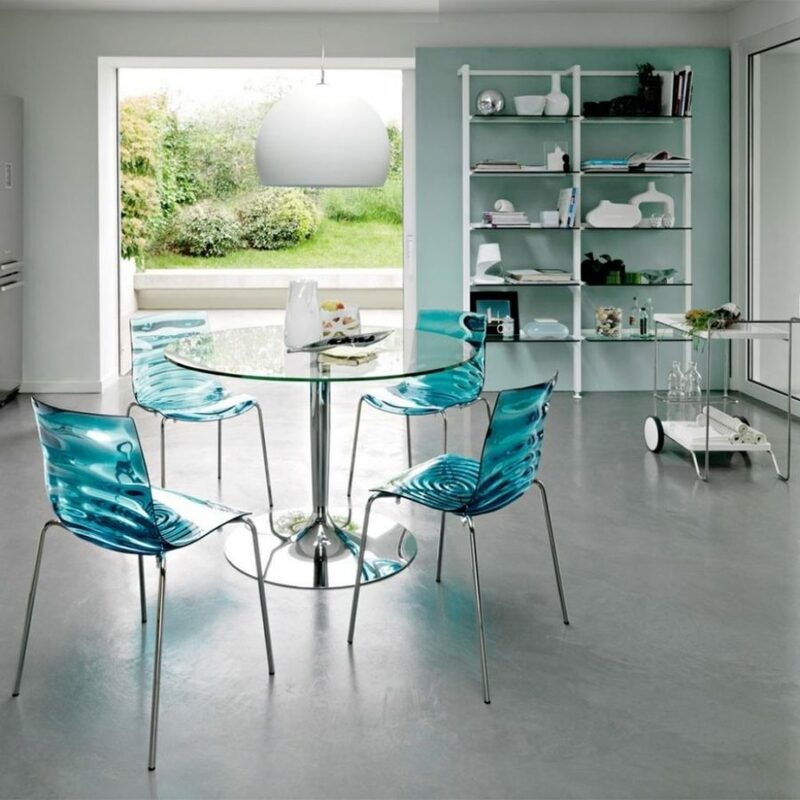 Check out these blue designs that make this glass table stand out in an entirely new way. Fitting to a modern scheme but staying within the simplicity of the space, these chairs also work in a variety of ways to – whether at the kitchen table or at your vanity. 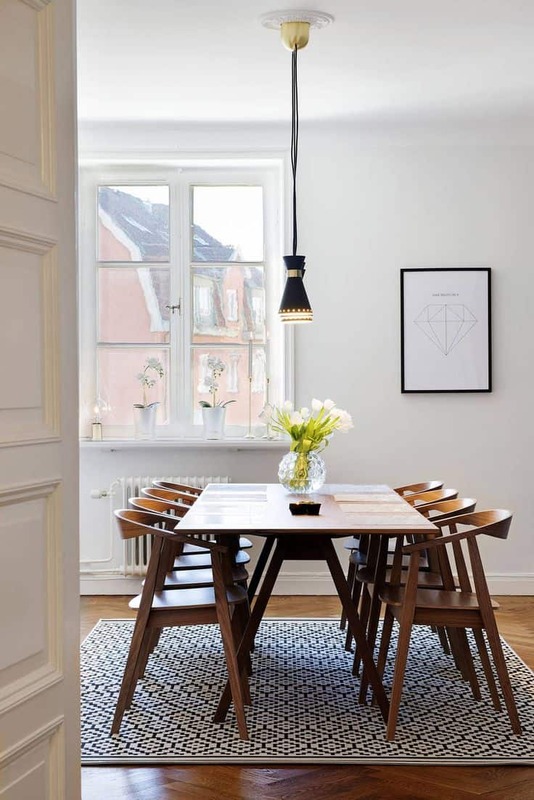 We stumbled upon this crisp dining room over on Pinterest. The space itself blends both modern and traditional styles with ease. And we feel that all starts with the chair design. Made with wood grounding it within a family-friendly vibe, its sharp, yet fluid lines keep it within a contemporary genre. When all else fails and you can’t find an accent chair to compliment correctly, this one will. It’s modern, it’s polished but it’s got a unique personality as well. 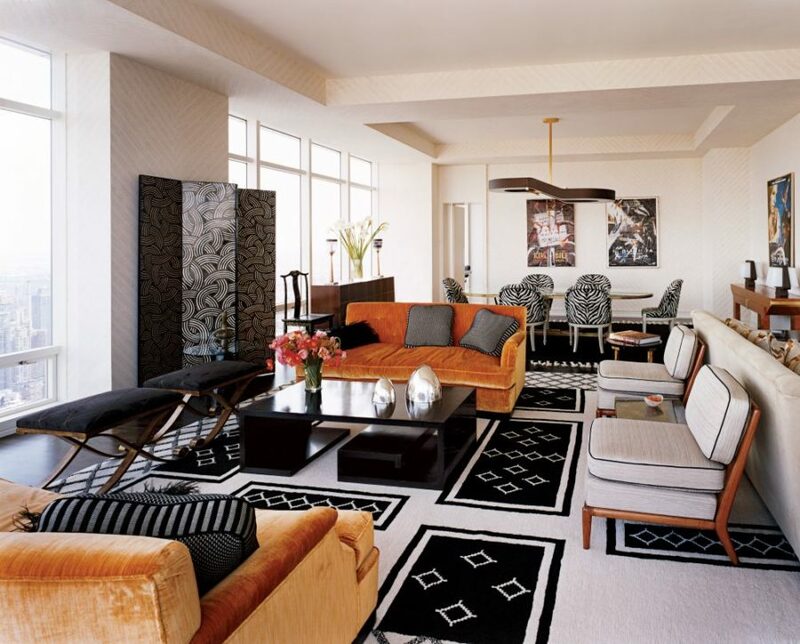 Blending within retro-inspired spaces, modern vibes and contemporary classic rooms, it’ll work every single time. Homedit showcased this gorgeous nook and we not only fell in love with the innovation and styling behind this unique space in the house, but yes, that chair too. It compliments the sofa perfectly but it’s delicate, fluid lines give it a femininity that sometimes lacks in more modern styles. These boxy beauties are good for more spacious rooms. Home offices or at a breakfast bar, as long as the area is more elongated, the chunk of the design won’t overwhelm its surroundings. It’s unique, square shape though breathe a bit of masculinity into the room, which is a great way to put a personal mark on a section of the home. Pinterest finishes off our modern chair inspiration with some outdoor finds! Just look at these netted beauties that not only coincide with a more natural atmosphere but within the confines of contemporary style too!